Botswana Horse Directory - O Horse! 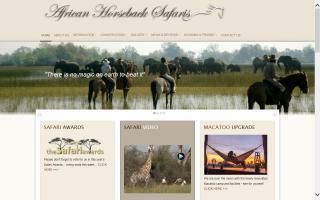 Welcome to African Horseback Safaris. Our horse riding safaris are based at Macatoo Camp, situated on the western side of the Okavango Delta. Covering 17,000 km sq, the Okavango is the largest inland delta in the world, a mix of labyrinth channels, palm fringed islands, and fertile floodplains. Trapped in the parched sands of the Kalahari desert, it is a magnet for the wildlife who depend on the delta's life giving waters. More than 400 species of resident and migrant birds, lions, elephants, hyenas, wild dogs, buffalo, hippos, and crocodiles congregate with a variety of antelope and smaller animals - warthogs, mongooses, genets, monkeys, and bushbabies to name a few - the ultimate landscape for a horse safari adventure! The main attraction of a horse safari is the joy of riding good horses over superb country, with just about every landscape dotted with game.